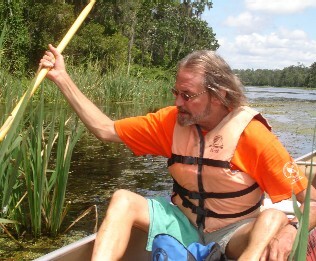 Wacissa, FL--Hamp Chauncey has been paddling with Fellow Travelers since he was a small child. After college graduation Hamp worked in Florida and made many of the trips with the group. He was such a handy man and problem solver that Hamp became the Wizard. But Hamp left the South and moved to White Plains, New York and most of his opportunities to paddle with the Fellow Travelers vanished. Hamp came back for a visit so the group decided to do a day trip on the Wacissa to give everyone a chance to have a little time with him. Hamp brought his sweetheart, Catherine Alexander, along to introduce her to the crowd. 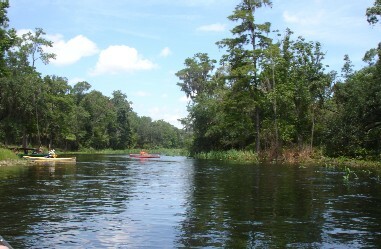 Twenty-one paddlers met at Wacissa Spring for the nine-mile float to Goose Pasture. Six were rookies. James Turk came for his first paddle and brought Michael “Doc” Estes and his son, Aaron Estes along for the first time. 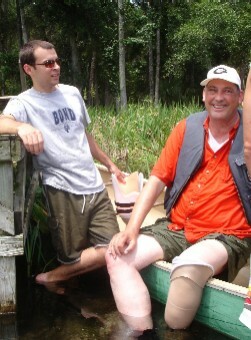 James is an amputee so he knew that getting in and out of a canoe might prove challenging but he mustered the courage and made it. Tristan Shelfer brought his sweetheart, Katie Peterson. Brad Ellis also introduced his lady friend, Patsy Shirey on the voyage. Haley Spiers brought Miley and Blakelyn with her, and her parents, John and Karen Chauncey c elebrated their retirement with the tribute trip for Hamp. Sam Brown came and soloed the Prism. Paul Tolar partnered with Aaron. Donna and Jerry Ellis kayaked. Charlie and Diane Stines canoed the Canadienne. Art Shelfer brought the rescued Ghost Boat but only paddled to Cedar Island. Katie and Tristan spent the entire trip at the Blue Hole Spring rather than journey to Goose Pasture. It was a beautiful day for canoeing. The temperature was only moderately scorching and was tempered by a gentle breeze. The Weatherman brought no rain. It was a typical Wacissa experience. There were a lot of birds including several baby gallinules. At least three alligators showed up. Sam collected snails, driftwood, and photographs. All went well until the remnants of the dam were reached. At that point Doc and James got sideways in the little chute and overturned. James did have some difficulty getting back into the boat but he was a good sport. It was only a short time later until he and Doc again overturned but they were still good sports. Miley and Blakelyn both seemed to enjoy the trip. Miley will not be three until January but this was her second day trip with the travelers and she proved to be a real trooper. She managed to ride with John and Karen for part of the trip and with Hamp and Cat for other portions. 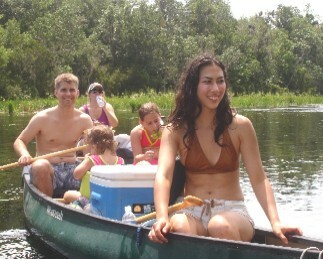 Haley and Blakelyn canoed together. It took a little longer than anticipated to reach Goose Pasture but most of the vehicles were there. (On the morning shuttle Charlie led the way and missed one of the turns causing the launch to be delayed a few minutes.) Sam and the Chaunceys rode back to the head spring and then everyone except Paul went to Art and Janice’s place for a picnic feast. Janice, Frank Sutton, Gloria May, and Donald May were there even though they did not make the river trip. James, Doc, and Aaron did not stay to eat because it was getting late and they had a long drive back to Pulaski County. James and Doc had dried somewhat from their spills. The meal was really good. Art cooked pulled pork, Sam brought beef brisket, Donna and Jerry brought potato salad, Gloria prepared her famous coleslaw, Diane made a pecan pie and lemon squares, Haley brought tea, and Charlie brought soft drinks. There was a lot of food left over but everything was better than good. Frank and Charlie told their usual tales to the delight of the rookies and the scorn of the veterans who have already heard about monkeys and dummies a few too many times. Donald took a hike when Charlie told the town drunk story. Everyone stayed until dusk and then went home.